Sunny blue sky day on Sunday 19th August in Davidson. Eyes were on a spider moving all over the back of the car in front of us which pulled out of the Rural Fire Brigade station at the end of the street! Grevilleas, wattle blossoms of yellow, a few cyclists and a couple of other marque classic cars were seen on the way to Wahroonga. The destination was on the north side so it was a short journey for Barbara & Tony for a change. The first group toured the house with a hostess while the rest finished their morning tea and chatted until able to do the house tour. We were then free to roam around the gardens. What a beautiful house and grounds. Mahratta means ‘Great Kingdom’ The original property (Federation House and land) was purchased in 1939 by the Caragabal Pastoral Co. Pty Ltd associated with the family of Mr TA Field. Mr Field decided to demolish the existing residence and build anew. He commissioned Mr D S Agnew, Architect to design and build a two story brick and tiled roof mansion in the styles of Art Deco and Georgian Revival. The theatrical charm and majesty of the house is very evident in the entry and Main Hall with is curved, scagliola finished staircase, curved walls and pilasters (a pilaster is an architectural element in classical architecture used to give the appearance of a supporting column but is only ornamental.) There were many unusual features like curved doors, large sliding doors with huge round glass windows, hidden bar behind curved sliding door with large window of , tiny hidden room for showing movies like a bia box in the ballroom and, a ballroom with sprung floor and an oval room. Most of the bathrooms are still original with renovations very close to original. Master Gardener Mr Paul Sorenson was commissioned to complement the original garden and the new residence by redesigning parts of the garden. In the 1.6 hectare garden there are 60 different native and exotic species and many mature trees making the gardens tranquil and a display of Natures magnificence. All the building elements were repeated with the landscaping wall, metal gates matching the house round features and metal work. 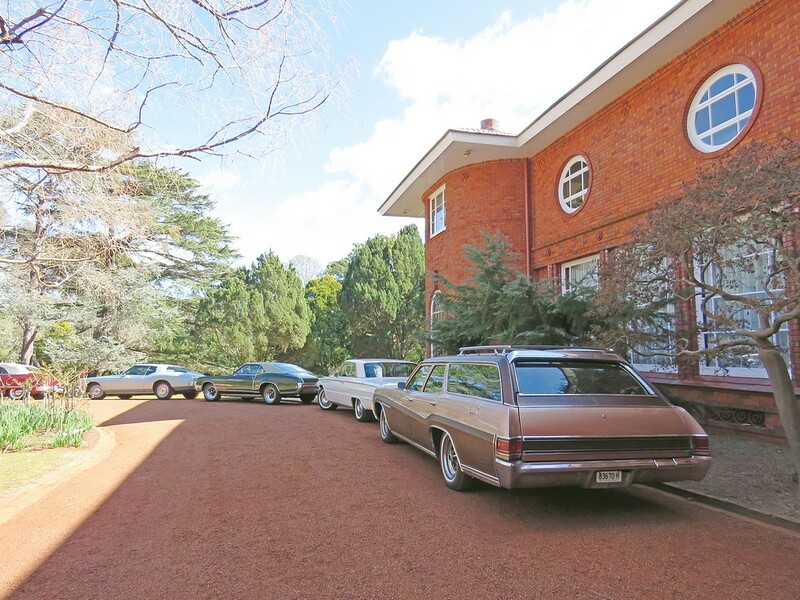 The house was eventually purchased by the Bank of New South Wales (Westpac Bank) as a training centre and now it is owned by the School of Philosophy using it for workshops and residential seminars. A group of volunteers called ‘The friends of Mahratta’ open the house and grounds a few days a year to raise funds for the ongoing maintenance of the house and gardens. Art Deco works are symmetrical, geometric, streamlined, often simple and pleasing to the eye. Georgian Revival – A revival subtype of the original Georgian style popular in the 18th Century and re emerged to more modest simplified houses built for new large scale residential developments from the 1920’s to 1950’s. Symmetry of doors and windows in front was down to 3 windows instead of 5 in the 2nd storey. Scagliola is a technique for producing stucco columns, sculptures and other architectural elements that resemble inlays in marble and semi precious stones. The Scagliola technique came into fashion in 17th century Tuscany as a effective substitute for costly marble inlays. After lunch and checking out the gardens, everyone gathered out the front to check out the cars and chat in the sun. The camellias, azaleas & clivias blooming were lovely along with the bare winter trees around the well maintained garden. It was good to meet some of our latest member, Richard & Chrissie Banks (1965 Riv), Dave & Kathie Scrimgeour (1962 Electra Coupe) and George Fahd and friends Bob & Kerry (1970 Estate Wagon) Also in attendance were Greg & Geraldine Massey (1968 Riv), Colin & Dawn Castle & guests Val & Ian (1950 Convertible), Wendy & Clause Gronau (72 Riv), Peter & Lyn Panich (1970 Electra), John Stewart & Helen (1983 Riv), 1st Lady Margaret Cook with friend Jackie, Keith & Nancy Packham with cousins Bruce & Cheryl, Ursula & Paul White, Gary & Janice Ferrett, John & Maggie Saddington were all in moderns Hopefully Jim & Virginia are feeling better as they couldn’t make the day. 33 people enjoyed the day and the run home was quick. Thanks for another great day Geraldine and Greg.